First of all I would love to apologize for not being online lately. I know, I didn't present some "The Look of the Week"-posts for you, but don't worry, all the missed ones will be online next week. But now, I would love to share a wishlist with you. Denim is a way of life, it has always been a symbol for style and "Jeans represent democracy in fashion" (Giorgio Armani). Denim clothes, white T-shirts and sneakers are eternal. They are comfortable, stylish and will remain classic forever. You can't go wrong with them. Wearing denim clothes with simple shirts, tops, combining them with a blazer, giving a plus with jewellery, layering denim on denim, everything is admissible. Fashion can be very mysterious and denim is for some reason timeless. Do you have any idea, why? Share your opinions in the comment section below. Jeans, denim shorts, dresses, shirts, vests and jackets. The listing is endless. 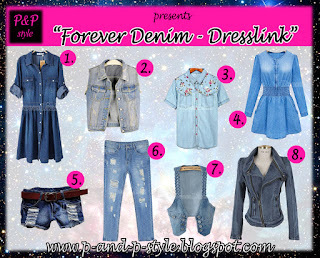 I collected some of my favourite denim pieces for you from the site Dresslink. Go, have a look, and tell me your favourites. I LOVE the fourth dress! The last one (moto jacket) is adorable. I'd love to wear those two. Denim is always a good idea during the summer months! Thank you so much for your comment! It's great to read that you liked my outfit! :D . About your post, I also love denim, hehe ;) . Have a nice day! I LOVE denim! That jacket is so gorg! I can't get enough from denim and thank you for the picks! I really love the dresslink website. Great set, i'm so in love with denim, too!